In the interim between my blogging I've discovered so many amazing brands. One happens to be Liquid Sky Lacquer. God I love this brand! As a self admitted holo whore shopping on her site for me isa skin to Alice romping through wonderland. 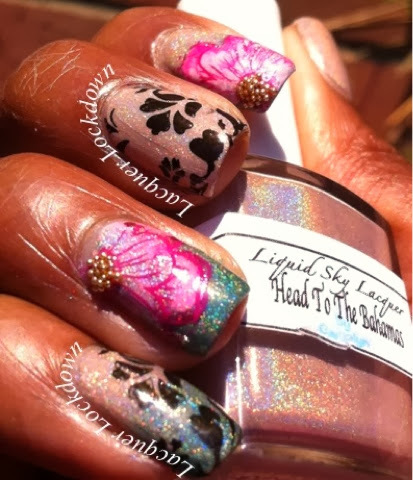 She makes super holos and some of the most amazing holo transitional polishes I have encountered. So today I have two of my favorites for you along with some lovely stamping featuring my new Winstonia plates. Enchanted Forest is a deep evergreen linear holo. It is rather intense, but requires a great deal of build up about 3-4 coats since the polish is thin, but it's totally worth it. I used it here to create a gradient. The technique I used for the stamping is fairly advanced. I used one of the newish square shaped plates W-04 to create the art. Stamping first and then filling in the pattern with acrylic paint. After that I stamped back over the filled in image and wha-lah! Instant pretty. Indoors shot. True to color but less fabulously holo. So what do you think? I've advanced quite a bit with my stamping skills though I still feel I've got lots more to learn. 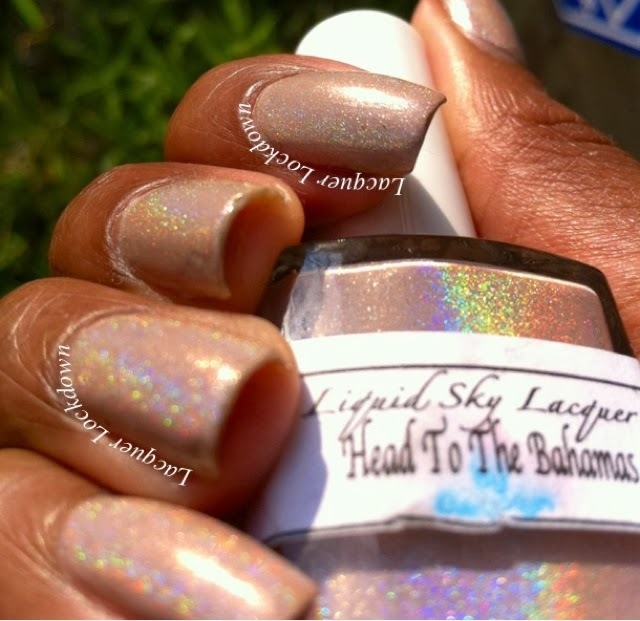 If you are interested in purchasing either of the LSL polishes click the link above. Carolyn is restocking on October 8th. For the plates you can check out either the link above or my page for stamping supplies. Thanks so much for reading and I hope you liked it! I'll see you next post! Beautiful!! I love your mani's! This is lovely! I was blown away by the picture on Instagram! I would love to see a tutorial on how you did the flowers. I have never heard of that technique. 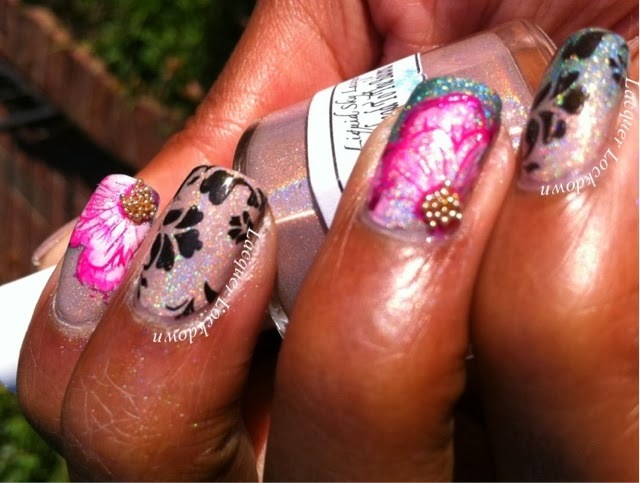 I freakin love this mani!!!!! I had to track down this post again just to let you know that you and this post are responsible for a whole lot of polish purchasing! In the two months since I saw this post I have purchased about 7 holo polishes and the Winstonia W04 plate you used...!!! 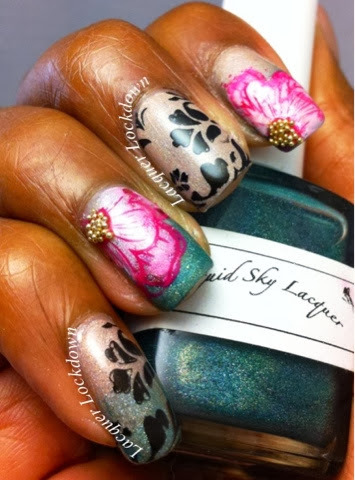 Thank you for showcasing such a gorgeous mani - I adore it! Lol you are welcome to gush! I'm glad you discovered a genre of polish you love! I still die inside when I encounter a holo that takes my breath away. I can tell you it happens at least once every other day there are so many great polishes out there. Thank you for the warm words it mean a lot!